Xe Systems, the Private-Defense-Contractor-Formerly-Known-As-Blackwater, has been busy attempting to re-brand themselves. They have a new name, several new sub-names, and have at least titularly shifted their focus to training rather than mercenary work. Controversial founder Erik Prince is no longer with the company, which is now owned by a large investment consortium. But apparently their PR department thinks it wise to take up the old Blackwater name one last time. At E3, XE Systems and their partners 505 Games (publisher) and Zombie Studios (developer) announced an upcoming Xbox 360 Kinect on-rails shooter called Blackwater. 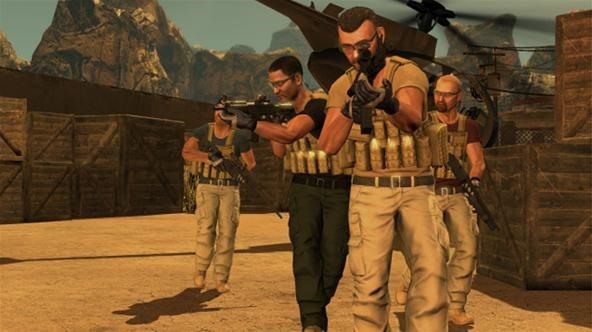 Xe Systems nee Blackwater has apparently consulted in all phases of the game's design to ensure its fidelity to the real thing. It will depict the agents of the notorious mercenary organization responsible for several of the most well-known examples of military misconduct in the Iraq War. In a wise move away from its sordid past, Blackwater and Zombie, the game's developer, have set the game in a hypothetical North African conflict. All the same, given the baggage associated with the Blackwater name, one wonders whether they will be able to overcome the firestorm of bad publicity that has already begun. 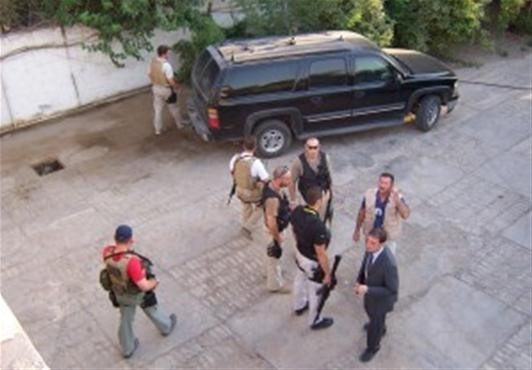 Blackwater contractors at the Repulican Palace in Baghdad. 505 Games might be the perfect partner for Xe, at any rate. They are certainly no strangers to controversy. They have a long and distinguished publishing history in Europe, but their North American catalog is dominated by games like Naughty Bear, BackBreaker, and the upcoming Supremacy MMA—games of questionable quality (at least for the first two) and stylistically violent presentation. They are also no strangers to working with non-game corporations, having previously made game adaptations of the films Hop, Grease, and Hotel for Dogs. Despite its questionable branding and corporate parentage, there are some signs that Blackwater might be actually be a decent game. It was playable at E3, and the Kinect controls sound more intuitive than I would have thought Kinect shooter controls were capable of. The game is being made with the Unreal 3 Engine, so the graphics should be at least passable. Also, Zombie Studios has a long and solid, if not exceptional, history in development, including developing the US Army's official game America's Army: Special Forces. Blackwater is scheduled for release before the end of the year, so stay tuned if you're looking for a serious Kinect shooter or just like to follow controversy.